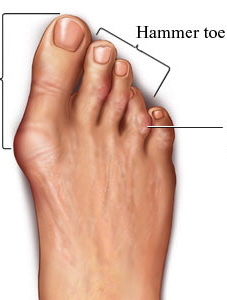 Bunions and hammertoes are abnormal, unsightly, and can even be painful. Are they due to genetics, bad shoes or bad luck? 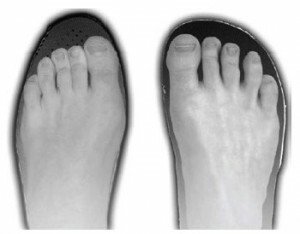 We will discuss these as well as prevention and treatment options for these common toe problems. A bunion is a bony bump at the base of the big toe. The big toe may also bend toward the second toe. Hammer toes are a curled downward, hammer-shaped position of any of the little toes. Wearing Shoes. 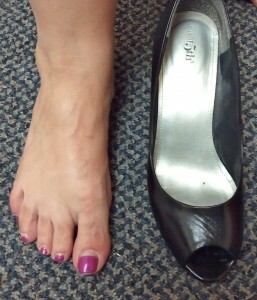 Studies have shown bunions can be as high as 50% in people wearing shoes compared to only 2% among barefoot people. Genetics. Some say it is not the genes themselves, but the foot structure and gait patterns that are inherited that can lead to bunions and hammer toes over time. Weak Foot Tripod. 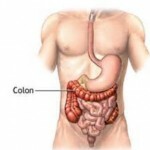 This can be due to muscle weakness, joint alignment or flexibility issues. The bottom line is toes will begin to bend, drift and deform out their normal alignment if they are pushed in that direction from poor shoe choices or the problems that lead to tripod breakdown. Go barefoot when you can around the house, in the yard, at the beach ONLY UNTIL YOUR FEET FEEL TIRED. If your feet are immediately more painful when barefoot, this is not recommended and you might want to have us check them out. Avoiding tight or pointy shoes that push your toes together. Wear shoes with a roomy toe box that allow your toes to spread out. Wear low or flat heels. Ask us to check you for foot tripod weakness. We will assess your posture alignment, foot strength and joint flexibility to determine if adjustments and exercises can help. We help people with bunions and hammertoes every day. If you or someone you know is suffering from either of these conditions and is looking for a drug-free, non-surgical option for these problems, contact us to see if we can help.